The Affliction Cain Velasquez UFC 155 Walkout Shirt is a 100% cotton slim-fit shirt with triple-stitching on the seams to ensure durability, and of course features the signature softness that every Affliction Clothing shirt possesses. 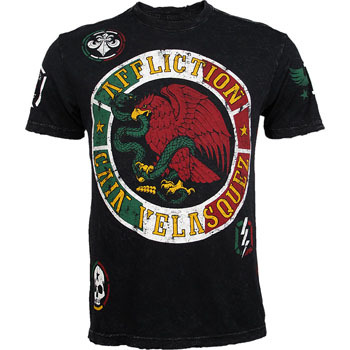 Aesthetically, it features the Mexican crest on the front, circled by Affliction and Cain Velasquez text, with the back featuring a Mexican flag with an Affliction twist to it. Perfect for every Cain Velasquez fan out there who is proud of his Mexican heritage, much like the champ himself. The Affliction Cain Velasquez UFC 155 Walkout Shirt is available at MMA Warehouse.